A quick update after day 1 of SHOT 2019. The 6-60X56 Genesis with 350MOA (100mil) of up elevation and 50MOA (14mil) od down elevation. The windage has a range of 150MOA (43mil). The 4-40X52 Genesis with 250MOA of up and 50MOA of down. The 5-42X56 with 140MOA (40mil) of adjustment range, super-ED lenses, 50MOA of adjustment per revolution and wide-angle eyepiece (26degrees) to increase the eyebox size. I'll have pictures and more to say about those later this week. The three scopes are all FFP. Here are some pictures from SHOT 2019. I'll come back to discuss the scopes. I didn't have much time to visit any other booth at SHOT, except for the Sig Sauer booth. I did talk to lots of people who came to the March booth and they, of course, would tell us about any other new thing in optics at various booths. That phenomenon works both ways, of course, and because of the Genesis and the new 5-42X56 FFP scope, we got visited by many competitors. Leupold sent two groups of people to visit our booth and they spend quite some time looking at the scopes and playing with them. It's not an issue because they have nothing approaching the March scopes in terms of capabilities and prices, so there's really no competition. Nikon also came in force and spent quite a bit of time at the booth and they even asked questions. Again, there is no overlap there either. I was happy to see Nikon folks as I have lots of Nikon photographic equipment (hence my screen name here,) and a few of their scopes. The upshot of this is that in strictly optical riflescopes, the three that I listed above represent the state of the art currently, which is why we were visited but did not reciprocate. There are digital scopes coming out and that will continue to expand, but ultimately you still need decent optics to capture the image. Let me explain why and how this relates to existing scopes and in the future, digital optics. In a riflescope, the portion between the turrets and the objective lens is what sets the tone, so to speak, for the whole riflescope. When I was looking at the 5-42X56, I was struck by two things: 1- the distance that I just mentioned was much shorter than in the 5-40X56 scope and 2- the adjustment range is about double what you usually have in a 30mm scope. There is a relationship between the two observations. As I described in the OP of this thread, the distance between the objective lens and the turrets actually represents the first focal plane setup. The distance between the objective lens and the turrets is the basic focal length of the scope. The significance of the turrets is simple; that's where the inner tube ends and the reticle of the FFP is located. If you have a longer focal length, you have more magnification, and less field of view; conversely if you have a shorter focal length you have less magnification and a greater field of view. With me so far? The focal plane is not a dot, it's actually a circular plane, and in this case it is 30mm in diameter, the inner dimension of the riflescope main tube. By using a shorter focal length than usual, we get a larger field of view, albeit with smaller details. After all you can only have so much on the focal plane, right? Now, I hear what you are saying, “NikonUser, if we have smaller details, that means we need more magnification somewhere else, right?” To which I answer, “I should think so.” This also means that your glass must be absolutely superb if you’re going to depend on a smaller image in the first focal plane, which you will magnify more later on. It is a testament to the glass on this riflescope that it has such great clarity and resolution so that even starting with a smaller image at FFP, we get a great view at the eyepiece. Now by virtue of having a smaller image at the FFP, this means the movement of the inner tube represents a greater displacement compared to the same movement on a larger image. This is how you get a 140MOA adjustment range without shrinking the inner tube and its lenses or expanding the main tube to 40mm or more. Also, you must match the reticle to this different focal length which is why existing reticles do not fit this riflescope and new ones have to be designed. Of course, you can have the exact same design as that of an existing reticle, but it must be recalculated for the new focal length as they are not interchangeable, or anything beyond a dot or dot/wires or something similar that does not depend on any scaling. Thanks,NikonUser, for all that, and especially your explanations. Excellent information. Here is a first quick diagram that I put together to help illustrate some of the things we're talking about here. It's not to scale, but I'm hoping it's not too misshapen either. This diagram illustrates the front portion of a variable magnification riflescope. My goal here is only to illustrate various parts and how they work together, this is NOT representative of any riflescope and the exact location of the parts is not definitive; this is just to convey the concept. In a side focus scope, that focus lens you see between the objective and the FFP moves back and forth and is controlled by the side-focus knob. What this lens does is to focus the objective onto the FFP depending on the distance from the scope to the objective. In an Adjustable Objective scope, elements of the objective lens group itself are moved to adjust the focus and so there is no Focus lens between the objective lens group and the FFP. An AO is simpler, easier to build and is better optically that a side focus, but it's more inconvenient to use. As I try to illustrate the FFP is where the image from the objective is projected and focused. The image is the size of the inner diameter of the main tube, or 26 millimeter in the case of a 30 or 34mm tube. The FFP reticle will be at the end of the inner tube, right in the plane of the first focus. This reticle can be a simple as a crosshair or even a dot, etched on the glass or as complicated as Horus or Christmas tree arrangement. The etching has to be extremely precise and as you can guess the dimensions of the reticle objects must be maintained with the focal length of that first part in order to be meaningful in the case of anything more complex than a crosshair or a dot. Actually even those simple reticles must have their dimensions just so in order to represent some size relation with the objective. This is where we see the specs that the dot is 3/32nd or 1/8 MOA, etc. The image at the FFP is going to be magnified according to the focal length of that first part. It's not a big magnification , more like in the order of a couple of Xs depending on the diameter of the objective and the distance between that objective and the FFP (also known as focal length) but it's some magnification. So the reticle dimensions must match the focal length here in order for the reticle to be useful in ranging and so on. That inner with the reticle at the front, contains the erector assembly that flips the image right side up and side to side and, in the case of a variable, the zoom lenses that will move back and forth to increase or decrease the magnification. The inner tube will have an OD that is smaller than the 26mm of the ID of the inner tube and that's where you get adjustment range. In a 1 inch scope, (25.2mm OD), the inside diameter of the main tube will be closer to 21.2mm instead of 26mm for the 30/34mm tubes. That extra 4.8mm of travel is what gives the extra adjustment travel in the 30/34mm tubes. So the inner tube goes up and down, left and right with respect to the stationary image projected by the objective in the first focal plane. When you twist the knobs you're simply moving the inner tube to look at a different place on the FFP. The field of view that you get at the reticle is dictated by the inside diameter of the inner tube and the magnification after the FFP. Anyway, this is a very basic diagram and it's not an exact representation of the afocal device called the riflescope, but I'm hoping it helps the reader understand a little more. I don't seem to have html markup capabilities, otherwise I would include the image right here. This forum software is a little ancient, but it is very fast and stable. Here is the rest of the diagram. In here, we see the zoom assembly and the location of the so-called Second Focal Plane. 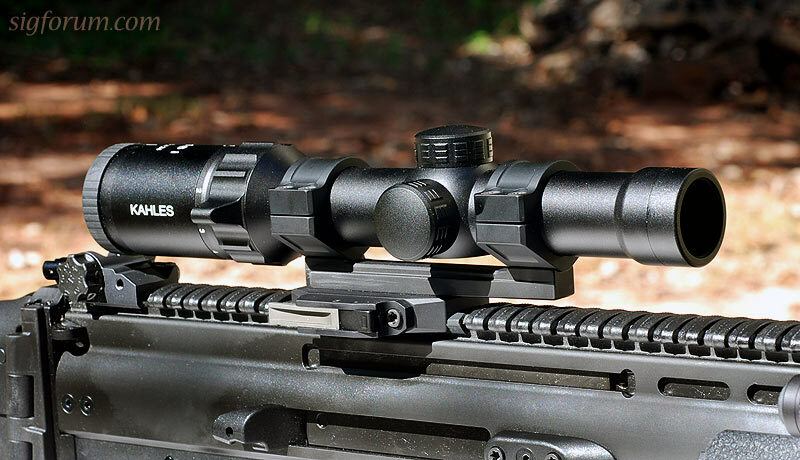 Irrespective of the design of your scope, there are First Focal and "Second" Focal planes in all of them; the SFP or FFP designations only indicate the location of the reticle. After the second focal plane you have the eyepiece assembly, which is an ingenious piece of optics in its own right. I has magnification and diopter adjustment built-in. You get more of an appreciation of the eyepiece assembly when you look at a spotting scope with interchangeable eyepieces such as my Kowa. I have two eyepieces for that optic, a Long Eye Relief 27X eyepiece and a 20-60X eyepiece. The LER eyepiece allows the eye to be further away from the eyepiece and still get a clear and complete picture. These eyepieces are expensive and little jewels of optics in their own right. And heavy too. Since there is not a reticle on which the spotting scope optics needs to be properly focused, these optics do not have a diopter adjustment, unlike riflescopes. I missed your post earlier. Thanks for the nice comments, I appreciate that. Well, age caught up to me. I've tried to delay it and to fool myself, but I just ended up being the fool. I now realize my eyesight has diminished and I can no longer discern the very fine MTR-2 reticle in my beloved March-X 5-50X56 scope. I have been struggling for the last year or so, and when I was at SHOT, I discussed this with the March team. They offered to change the existing reticle to any other that they have for that scope. I chose the MTR-5, their latest addition to their reticles, as it is just like my MTR-2 but twice as thick. I sent the scope to them a few weeks ago and they have received it and have done the change and are sending it back. In the meantime, last week, I mounted my original NF NXS-12-42X56 with NP2DD reticle and went to a 1000 yard match. I thought I had the dope proper, but my first shot was not detected by the eTargets. At this point, I was worried as heck because there was no one down in the pits to guide me and I was looking at a blank wall. I purposefully asked to be the second relay shooter so I could see what the conditions were like by observing the first relay shooter. After my first shot, I realized that I did not take into my observations and had held dead center. The wind was left to front right (very rare for our range) and it was cold that day. My comeups had been computed for 80F, not 35F and I had neglected to hold for wind. So for my second shot, I held high on the left, in the 7-ring at 11 o'clock and pressed the trigger. I was rewarded with a hit in the 6-ring at 5 o'clock. So, my first shot had been off target on the right and low. I quickly adjusted the scope and the next shot was a 9 at 6 o'clock. The next one was in the 10-ring and after a few more shots, to warm up the barrel, I started shooting for record. After the match, I silently kicked myself for neglecting to heed my observations for my first shot and wasting a perfectly good bullet. I did notice that I was able to use the NP2DD reticle in the NF without any trouble, and that's great because it's the same thickness as the MTR-5 from March. I also noticed the NF, while still a very nice scope, is just not a March. I can't wait for it to get back here. My March was delivered at the house today. At first glance it looks pristine and I looked through it and the MTR-5 is definitely what I needed. I will try to get to the range tomorrow to mount it. I got to the local range the day after my scope came back from Japan, I was just so anxious to see how it worked out. The range is a private, members-only range about 15 minutes from my house and it has 100 and 200 yard target lines and a full complement of about 50 benches. It's an amazing range that I use for testing and load development and the times I want to shoot my Sig pistols as they have all sorts of pistol distances target lines. First, I stopped by Office Depot to pick up target material, in this case a large 36X40 poster board for $4.00. When I got to the range, I backed up my SUV right next to a long table just behind the firing line and unloaded my rifle, tools, ammo and scopes. And my "target". The tables are huge, easily 6 feet by 10 feet. I drew 3 vertical lines on the target about 9 inches apart, with a Sharpie and a yardstick. I marked a nice X at the bottom all a half inch from the edge. Then from the X, I marked off every inch starting at 24, all the way to 39. My load calls for 35 MOA at 100 yards for a 1000 yard zero. That varies a bit depending on the weather, of course. My rifle had been shot at the last 1000 yard match with its 1000 yard zero still set, and a 1 MOA left wind correction still dialed in the Nightforce 12-42X56. I stapled my target at the 100 yard line, with the bottom well off the ground and the 34-40 inch area above the wood beam of the target holder. No need to mess up the word. I set up my rifle on the bench with the bipod and the read bag and proceeded to shoot 3 rounds on target, aiming at the bottom of the left vertical line on the target. The shots appeared at 36 inches about 1.5 inch left. Exactly where I was expecting them. It's always nice when a plan comes together. The inch is the MOA of left wind and the other .5 inch is the spindrift to 1000 yards, which does not occur at 100yards, of course. The first shot was a little lower than the other two, but that's to be expected from the cool barrel. I closed the ammo box, pulled out the bolt and proceeded to swap the scopes. At this point, since I have a Picatinny rail on the rifle, I simply unscrewed the rings from the rail and put away the Nightforce after dialing back the minute of left wind, with the rings still on the scope. This is now my backup scope dialed in at 1000 yards with a "no-wind" zero. The rings are extra tall 30mm Burris Signature with 0-0 inserts. Then I placed the new rings, this time March 34mm extra tall rings, on the Picatinny rail and then I placed the scope on the rings and tightened down the screws with my torque screwdriver, in rotation, making sure the reticle was level. That's easy to do as the target line is very straight and level and I confirmed it with a level set. Here is a picture of the setup after, before I added the sunshade. The first setting is the distance between the eye and the rear of the scope; you want to make sure that you have a complete view of the rear eyepiece, in shooting position. You want to be able to have that complete picture without having to crane forward; it must be seen in a relaxed position, especially if you spend a lot of time looking through the scope. Notice that it has shifted a tad to the right when I was trying to take the picture. Finally I place the front ring after the level, but it does not obscure the background of the level. I always make sure that the rings are on the tube not near or adjacent to any structure like the erector set in the middle, or the objective bell or the zoom controls, etc. I try to leave at least a little bit of room. Also, I try to make the footprint as long as possible to minimize the possibility of twisting the scope in the case or in transit. This set up worked out well this time as I was able to achieve all my goals; I love long Picatinny rails. After the scope was installed, I did a quick peek through the bore and the scope to make sure I was on the target at 100 yards. The scope dials indicated that it was around center in windage and lower than the regular 1000 yard setting. I should point out that the rail has 20 MOA built-in, so I was not afraid of going under the target at this distance. Then I took the first shot, again aiming for the bottom X, this time, the middle line. The impact was about 12 inches high and 3-4 inches to the left. Excellent. I added a full revolution of up elevation and dialed out 3 MOA right and took another poke. I expected to be about midway between the first shot and the 36 inch target. I was climbing in 10MOA increments to make sure the dialing was proper. The second shot was about an inch left and 23 inches high. As expected. I added another full 10MOA revolution of up and took the third shot. At that point I was in the markings right a 34 inches and still left, about an inch. I dialed out .5 MOA of left and added 2 MOA of up and the 4th shot was predictably at the exact same place as the shots with the NXS, but closer to the vertical line. I zoomed out from 5X to my regular 40X and took a few more shots to make sure everything was solid and they all clustered right in the same spot. I rechecked all the screws with my torque screwdriver; nothing had changed. I now have my March-X 5-50X56 set at 1000 yards for the next match and I have my NSX set as a quick-replacement, backup scope. Back home, I user my boresight laser to get the setting at 10yards, so that when I travel I can verify the scope in the hotel room. Always a good thing to do. I noticed that the NXS does not focus down to 10 yards and is a pain to verify that way, but the March does and it's nice to have that extra security. this guy put the large end of the scope to the rear , the little end forward. and this guy does it the other way around. is there an advantage to having a scope mount one way or another? does one size at the front or rear make any difference at all ? or the are they both the same , only different ? Scopesights can be mounted only one way. If turned around, the image will be very small (reduced, not magnified) and usually it will be possible to see the inside of the tube to some degree. If you have ever looked through a binocular tube from front to back, the effect of looking through a scopesight backwards is the same. Whether the larger lens is the objective (front) or the eyepiece (rear) depends on the design. Usually low powered sights have smaller objective lenses and will therefore seem reversed as compared with high power sights. It’s probably discussed here someplace, but the reason high-powered scopesights (and telescopes of various types) have large objective lenses is to let in more light and therefore make the viewed image brighter. There is a practical limit to viewing with the eye, however. In most people the maximum diameter of the pupil is about 7 millimeters. Generally speaking, the “exit pupil” of a telescope is a function of the magnification and the size of the objective lens. To determine the maximum size of the exit pupil, divide the objective lens size by the magnification. At one time binoculars of 7 power with 50mm objective lenses were popular for low light viewing because 50 ÷ 7 ≈ 7, which was as much light as the eye could absorb. At lower powers, there is no advantage to a larger objective lens, so they’re left smaller to reduce costs and for other reasons. The Kahles scope pictured is, I believe a 1-6×24mm sight. At 6 power the exit pupil would be 4, but at 4× it would be 6, or close to the theoretical maximum, and probably the max for many people, especially oldsters like me. The designers probably figured that such a sight wouldn’t be commonly used under low light conditions and therefore the 24mm objective lens would be plenty large. A similar sight that I own is the Leupold 1-6×20mm, so its maximum light-gathering capability is even less, but it works just fine under daylight conditions at max power. If, however, my 18× sights had 20mm objective lenses, they would be very dim indeed, and unusable under low light conditions. I think you need a "Scopes for Dummies" book. Surely no one would clutter up a serious, stickied thread with a joke question—especially one that would result in the inevitable reposting of large photos—would he? if its so o o o easy , why don't you answer the question? why do some scope's have the big end in the front and others have the big end at the back? there must be a benefit ? right? But seriously, there is only one way to look through a scope. It's from ocular where your eye goes, to the objective which is the front of the scope. Some optics have large objectives to gather light and some don't. The ocular is usually the smaller of the two, but not always. Now you have me wondering if you are serious. Sigfreund took the time to answer your question very nicely and in a detailed way as well. It's all on the design of the scope, and what that design was trying to accomplish in the first place. Just remember a few things; ultimately, the goal of the riflescope is to place an image of the objective and the reticle on the same plane and present it to your eye that way. You need a minimum size of ocular lens to be useful for that purpose, so regardless of the objective size, the ocular will have a pretty standard size. This is why some riflescope can have a very small objective and others a very large objective, but the ocular remains pretty much constant in size. I went and rechecked the thread. I guess the answer is that the diameter of the lenses is irrelevant and where they are located is irrelevant also. thanks for input , sorry about my misunderstanding.